Hitting the open road for a summer vacation has been a popular pastime for generations. For kids, however, road trips can get boring fast without something fun to keep them busy. While you might be tempted to turn on the DVD player to keep your little ones occupied, there is no benefit for your child zoning out, staring at a screen for hours on end. ABC scavenger hunt: This is a classic road trip game, and each family member can join in on the fun! Have everyone go in order from A-Z identifying objects around them that they see that start with that letter. The first family member to find something that starts with each letter wins! For a twist on this game, prepare a scavenger list ahead of time writing down the word and including a small image or illustration. (Example: A for American flag, B for boat, etc.) Have your kids cross of the item on the list when they see it. Tongue twister sentences: Choose a letter or a sound. Everyone takes turns creating funny sentences that start with that same letter or sound. To make this more difficult, have your kids use something that they see around them in their sentence. Challenge each other to make the funniest sentence to keep everyone laughing. Color search: Someone picks a color and everyone tries to identify the color with something they see outside the car. Make this a contest by encouraging everyone to come up with an answer as fast as they can. The person who wins picks the next color and starts the game over again. To make this game more difficult, limit what players can pick to only cars. For example, if the color is blue, tell everyone that they need to find a blue Ford. Counting cows: If you’re driving through farm country, count cows! Each time someone in your car sees a cow on their side of the road, they shout “count my cows!” and they count as many cows as they can before they are out of sight. Everyone keeps track of the cows that they count, and by the end of the drive, (or other predetermined landmark or timeframe) the family member with the most cows wins. The catch is that anytime someone sees a cemetery or graveyard on their side of the road, they have to “bury” all their cows and start over. If you pass by a cross on the side of the road, subtract a set amount of cows from your total. ABC license plates: Encourage your kids to find every letter of the alphabet on different license plates, in order. Start the game when someone sees the letter A on a license plate, and each player will have to wait until they see a B on a different license plate. The player who finds the most letters wins. To make this game easier, include letters found on road signs, billboards, or trucks. "I Spy" with different rules: Instead of playing the usual “I Spy” game with colors (which you can still certainly do if you wish), mix up the rules. Use geometric shapes instead. For example, “I Spy with my little eye, something… that is a pentagon.” You can also include rules that require kids to count: “I Spy 3 things that are the same”. By altering the rules to a common and classic game, you can easily incorporate math learning. I’m going on a picnic…: In this fun memory game, each family member imagines what they might bring on a picnic and names something they would bring that starts with the letters of the alphabet. The first player starts on the letter “A” and says something like, “I’m going on a picnic and bring apples.” The next player has to remember the first item and add onto the list by saying something like, “I’m going on a picnic and bring bananas.” For each new letter, a new item is added, and challenges kids’ memories while they remember what everyone else has said. The player who can remember the most wins! When all else fails, keep a charged smart phone or tablet handy on which your child can play fun and educational games. 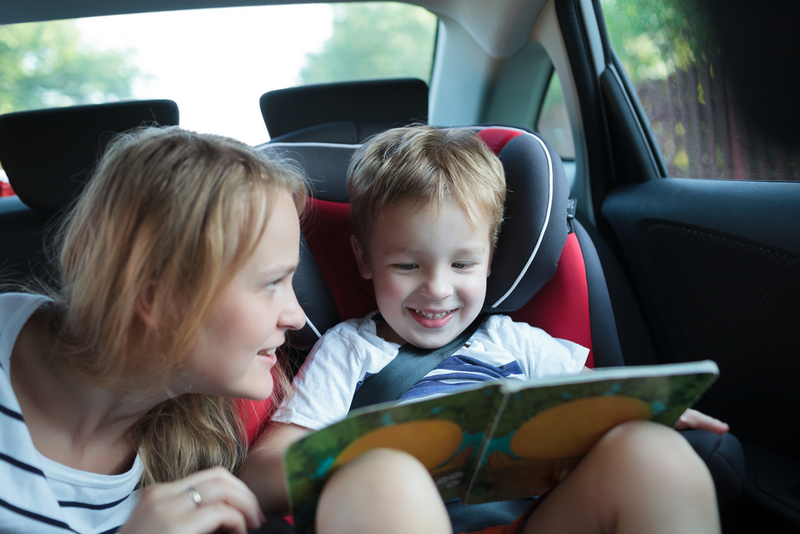 Using the above learning games for kids, car travel will not only be fun, but will also enrich your child’s learning to keep young minds growing, even on the go.